There are a lot of health benefits of turmeric. This is such a common spice in the kitchen. We use them for many curry dishes or just for adding yellow color to diverse Indonesian soups and food. Turmeric has a bitter and musty flavor. Use sparingly in your food. It will dominate the whole dishes if you use it too much. Just like cumin, that has strong flavor too. But beyond that simple and tiny spice, turmeric hold a truly beyond description of health benefits. It can be used for a simple daily accident and according to research it can even fight cancer and Alzheimer. Take for an example, your growing child felt en he has terrible wounds. You grab a kid’s plaster. I suggest you to get grated turmeric, the safest remedy at home, add some water and smear it to the wounds. This is the best way to cure it. This spice has an antibacterial and antiseptic quality, very useful to treat wounds and burns. You can use this spice for a lot of simple things in the house. Especially if you have children, this is certainly very useful, easy and nature products, the best products that you can use to treat most common sickness in your family daily life. 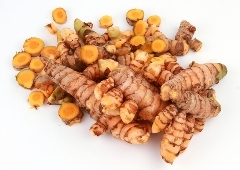 The active component of turmeric, the curcumin take care of all that wonderful healing. It’s also containing a lot of manganese, iron, vitamin B6, dietary fiber, and potassium. According to world health Centrum, turmeric has very excellent food rating. If you worry that your children during cough and flu period not be able to breathe correctly in the nights, mixed some grated turmeric or turmeric powder with 1 or 2 teaspoon honey, add some hot boiled water and put it in your children bedroom so your children can inhale the smoke of this blend. And the nights would be very pleasant for your children. For women, this can be a very useful spice to take care the entire skin problem. Use turmeric in your bath daily, it can be result in a beautiful and smooth skin, and hairless body. The root can be cook lightly and eaten. Or you can also make a drink by mixing turmeric powder with sweet tamarind, which result for much greater health benefits.